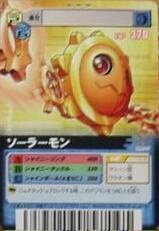 A Machine Digimon that appears to be a rare species of Machine-species Digimon. Among researchers, it is said to be a mutation of Hagurumon, but the truth is a mystery. Due to its "Computer Kernel" generating heat, its body has become hot enough to cause burns. 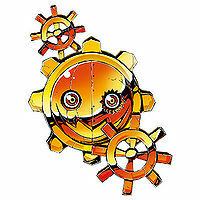 Its Special Move is throwing a gear that generates intense heat, scorching the enemy (Shiny Ring). A Digimon that has a similar appearance to Hagurumon. 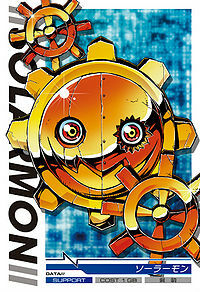 It is said to be a rare species of Machine-species Digimon. It releases intense heat from its body and it is hot enough to cause burns if touched. 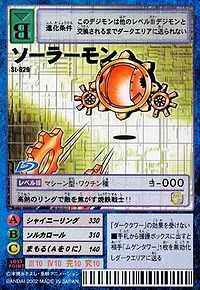 A Machine Digimon that appears to be a rare species of Machine-species Digimon. Among researchers, it is said to possibly be a mutation of Hagurumon, but the truth is a mystery. This profile matches its partner in the Digimon Reference Book, except that "である" has been removed after "謎", "ヤケド" is written in kanji and a period on the final sentence. adj.,Solar means relating to the sun. 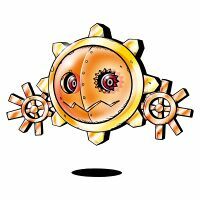 Sol Calor  ソルカロール Soru Karōru Releases a Sun-like burst of fire from its body in all directions. 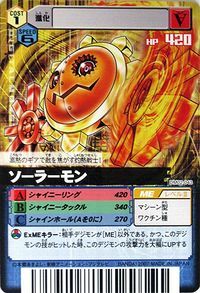 Shiny Ring  シャイニーリング Shainī Ringu Throws or shoots gears covered in fire. Shiny Tackle  シャイニータックル Shainī Takkuru Tackles the opponent while burning. Shiny Attack  シャイニーアタック Shainī Atakku Tackles the opponent. Little Burn  リトルバーン Ritoru Bān A self-destructive explosion. Shine Ball  シャインボール Shain Bōru Shoots a bright fireball. This burning iron warrior scorches enemies with its high-temperature rings!! 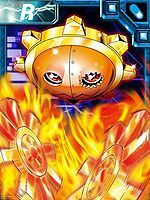 A rare species of machine Digimon! Its body radiates high heat that makes it dangerous to even touch!! 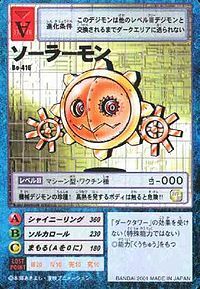 A rare Machine Digimon that is thought to be a mutation of Hagurumon. The Digicore within its body emits heat, causing its entire body to get heated to temperatures high enough to cause burns when touched. This page was last modified on 15 October 2018, at 19:35.